Ten Feet Tall holiday programmes are engaging and fun! We purposefully keep our holiday programme numbers small so that your child has a fantastic day gaining skills and fun. These holiday programmes are for Kristin School Students Only. Public Courses will be offered later in the year. Ten Feet Tall’s holiday programmes are for small groups of students who are committed to improving their skills in a encouraging and supportive environment. For some of our students, public speaking and drama performance might not be their first form of fun: we totally get it, and work with students regularly who feel this way. Many of our converts have great things to say about the week they spend with us! We take a maximum of 16 children on a programme. 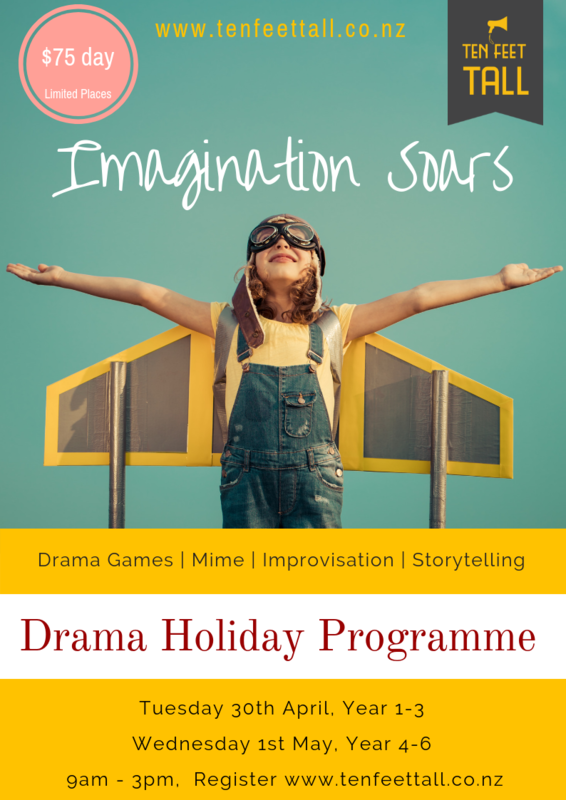 Always action packed and fun, our holiday classes focus on developing speaking skills and performing confidence. If you have specific skills you would like us to work on with your child, we can develop classes around your specific goals. If your child takes classes weekly with Ten Feet Tall – invite a friend to the same holiday programme and we will give you a $10 discount on your Term 2, weekly classes invoice. We would love to have you join us, please fill out the form below. Sign up for our 2019 holiday programmes. Please note Kristin School Students only. Please choose which holiday programme your child will attend. I agree to drop my child off after 8.45 and pick up 3pm. I understand if my child is absent on the day of the holiday programme there is no refund. I have communicated to Ten Feet Tall, any medical conditions or learning difficulties that might impact my child. If you attend Ten Feet Tall weekly classes: -Invite a friend to the same holiday programme on the 30th of April or 1st of May (They must be new to Ten Feet Tall classes). Once they register and pay we will give you a $10 credit on your Term 2 invoice.